Gina Evans and Glenn Stark have been very busy with this wonderful project. 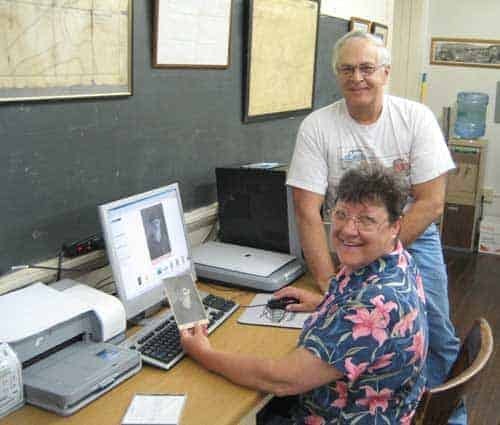 They are organizing and scanning thousands of old photos of people and places in Wyoming County (and the surrounding areas) into a huge digital database. These are photos that have been donated to the society over the years, and which were found among the holdings. 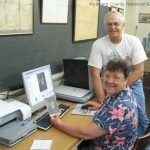 After scanning, Gina and Glenn keep the original photos safe in individual, archival envelopes for the future. The INDEX of these photos will eventually be available online for you to search, and we will be updating it as further scans are completed. The photos are available for a small fee and different sizes are offered. Recently, I found out that Fred Jennings was Mehoopany’s photographer around 1900. The photos and cabinet cards produced by his studios read “Fred. Jennings, Mehoopany, PA.” I’ve already found a couple that contain photos of my ancestors. If you happen to think of it, could you please notify me if you run across any that fit the above description?